PICTOU, N.S. -- Dozens of fishing boats steamed towards a hulking pulp mill in northern Nova Scotia on Friday, marking the climax of a boisterous demonstration that saw more than 1,000 protesters call on the mill's owners to scuttle a plan to dump millions of litres of effluent a day into the Northumberland Strait. Chanting "No pipe, no way!" a long line of marchers streamed onto the pier of a sun-drenched marina in Pictou, which is directly across the town's harbour from the massive Northern Pulp mill. A fishermen's group estimated that about 200 boats were part of the flotilla that sailed into the breezy, choppy harbour around 1 p.m., then circled back to the marina as a protest rally got underway. Lynn Plexman, a retired local resident who moved from Ontario eight years ago, said the mill's pipeline plan could hurt tourism and the fishing industry all along the strait between Nova Scotia and P.E.I. "I was shocked when I first found out about Northern Pulp's plan," she said, a placard reading, "No Pulp Waste in Our Water" leaning against her knees. "We are tired of the pollution. We've had tourists leave because of the air quality. Most people around here want it closed." 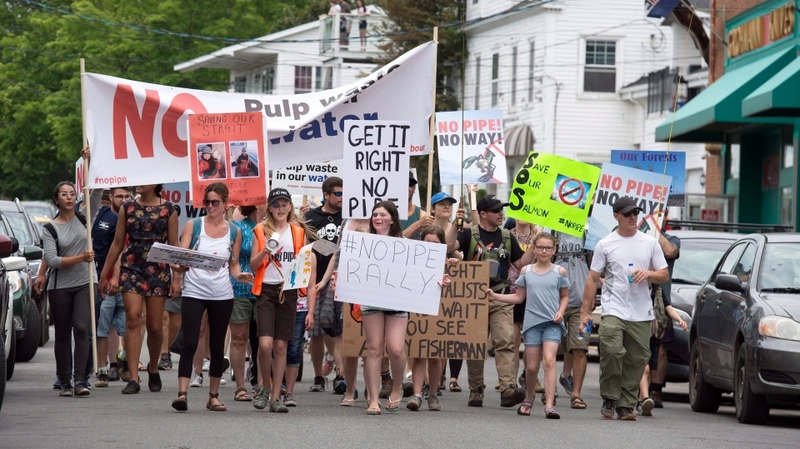 Though the kraft pulp mill provides much-needed jobs for the town of about 3,000 residents, its pipeline plan has also raised concerns about the impact on the lucrative lobster fishery. After years of pumping 70 million litres of treated wastewater daily into lagoons on the edge of the nearby Pictou Landing First Nation reserve, Northern Pulp wants to dump it directly into the strait. Kathy Cloutier, a spokeswoman for Paper Excellence, said in a statement that of the 131 kraft mills operating in North America, about 20 per cent use a system like the one proposed for the mill at Abercrombie Point. The remaining 80 per cent use a system similar to the lagoon system now in use. Cloutier said options are limited, as no other effluent systems are used in either the U.S. or Canada. "Northern Pulp has thoroughly investigated treatment options available," Cloutier said. "This $70-million project will considerably reduce the need for bleaching chemicals by 30 to 40 per cent to whiten the pulp as it progresses through the system." Nonetheless, Pictou Landing First Nation Chief Andrea Paul said her people's fight against the mill isn't over. "There have been many people working tirelessly for years to bring this to the forefront," she said after stepping from one of the fishing boats in the harbour. "This is not going to end today. We will continue to be on this water because we have a duty to protect all that lives in the water." Pictou Mayor Jim Ryan told the crowd that the province's decision to conduct a Class 1 environmental assessment wasn't good enough. He wants a federal environmental assessment. "The town of Pictou will continue to take the firm position that protection of the fishing industry is paramount," he said, sunshine glinting off the large chain of office around his neck. Earlier in the day, P.E.I. 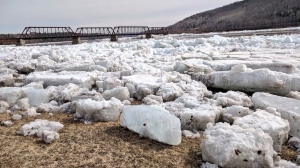 Premier Wade MacLauchlan issued a statement saying he had written to federal Environment Minister Catherine McKenna and Nova Scotia Premier Stephen McNeil to express his concerns about the potential impact on the ecosystem of the Northumberland Strait. "Given the amount of time that has passed and fresh uncertainty about the Northern Pulp proposal, I believe there is now an opportunity to take a more fully collaborative approach," the letter says. The mill's parent company, Paper Excellence based in Richmond, B.C., has said the mill and its 300 employees will be out of work unless it can build a pipeline that would meet all federal environmental standards: "The bottom line is no pipe equals no mill." 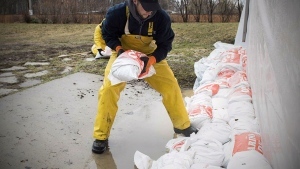 Under provincial legislation passed in 2015, the mill has until 2020 to replace its current treatment plant in nearby Boat Harbour, and McNeil confirmed Thursday he is sticking with that deadline. He said he didn't know much about the protest, adding that he wasn't surprised by the reaction to the pipeline proposal. "Any time there's a development, there will be those who have opposing views, and they are polarizing at times," McNeil said after he shuffled his cabinet Thursday, appointing a new environment minister in the process. Before the protest got underway in Pictou, Nova Scotia NDP Leader Gary Burrill said the province should abandon its plans to conduct a Class 1 assessment and instead order a more stringent Class 2 assessment. If that doesn't happen, then the federal government should be approached to conduct a comprehensive review, he said. "Either of these would accomplish the goal of having entirely trustworthy information in front of everybody," Burrill said. He also called attention the mill's spotty environmental record as its ownership has changed hands several times since it opened in 1967. 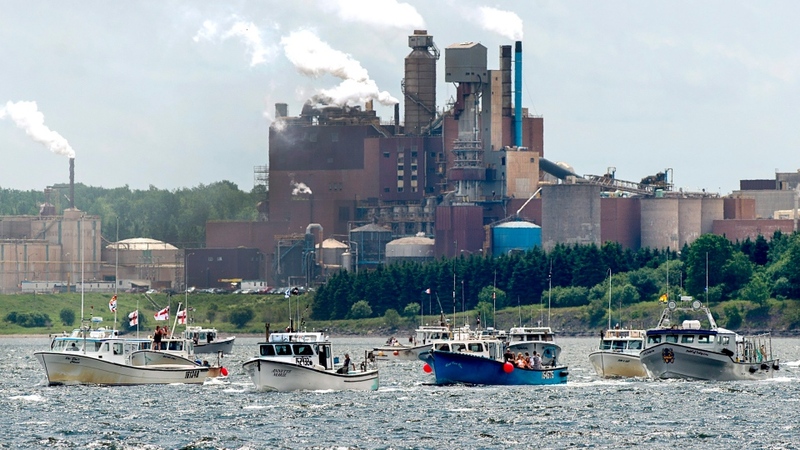 In February, groups representing fishermen in Nova Scotia, P.E.I., and New Brunswick suspended further meetings with the mill after voicing frustration over its insistence on a pipe. Earlier this month, the company said the proposed route of a pipeline would be changed to avoid potential ice damage. That means the company has delayed filing its environmental assessment with the province. The mill generates over $200 million annually for the provincial economy by making 280,000 tonnes of kraft pulp annually, primarily for tissue, towel, toilet and photo copy paper.